After long deliberations, the winning poster for the races in January 2018 has been announced. Over 110 artists submitted around 250 designs. An artist from Germany has won the competition. Horst Wittmann from Munich was surprised to receive a call from the offices of the Kitzbühel Ski Club (K.S.C. 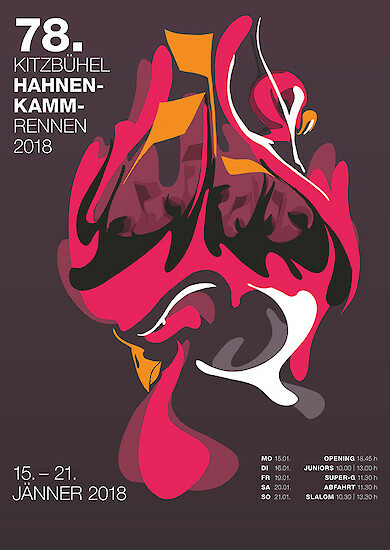 ), Organizers of the Hahnenkamm Races. “I am absolutely delighted” was the first thing that went through his mind. “The spectators are a key component of the Hahnenkamm Races, which is why they play a central role in my concept. They cheer the athletes on, who ski down a ridge above their heads”, explains Wittmann. “The traditional motif of the artists’ poster is incorporated in this powerful abstraction, the chosen style allows the picture elements of the cockerel, spectators and skiers to merge into one magnificently united whole”. The 37-year-old designer studied at the Academy of Fine Arts in Munich and, together with fellow students, founded the HANSANDFRANZ Studio. Under his leadership, the multi-award winning design studio develops interdisciplinary solutions with a strong conceptual focus for companies and institutions in the cultural and lifestyle industry. The poster costs Euro 15, and proceeds generated by its sales are donated to support Kitzbühel’s up-and-coming young ski talent. The poster will be available from mid-July onwards from Kitzbühel Tourist Information offices or Kitzbühel Ski Club. The poster is printed on high-quality paper.